Way back, before we came along, the smaller garden I call the NE Garden was part of a field cleared from the swampy woodlands. Someone who grew up in this area told me that the owners kept the bulls in this field. Once this house was built a fair amount of the lot was left alone and only mowed once or twice a year. Mom then started putting in gardens. The NE area was remote enough from the house that it wasn’t used for much. 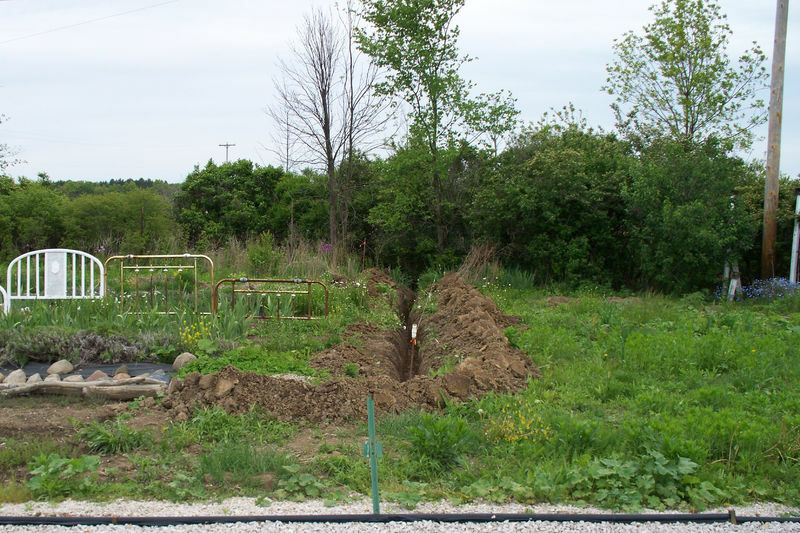 Being right next to the two large drainage ditches and with so much other area to garden it wasn’t a priority. As time went on the NE area was mostly left alone, used as a place to burn things and then turned into various flower growing gardens but it was not covered or made into a more formal flower bed. 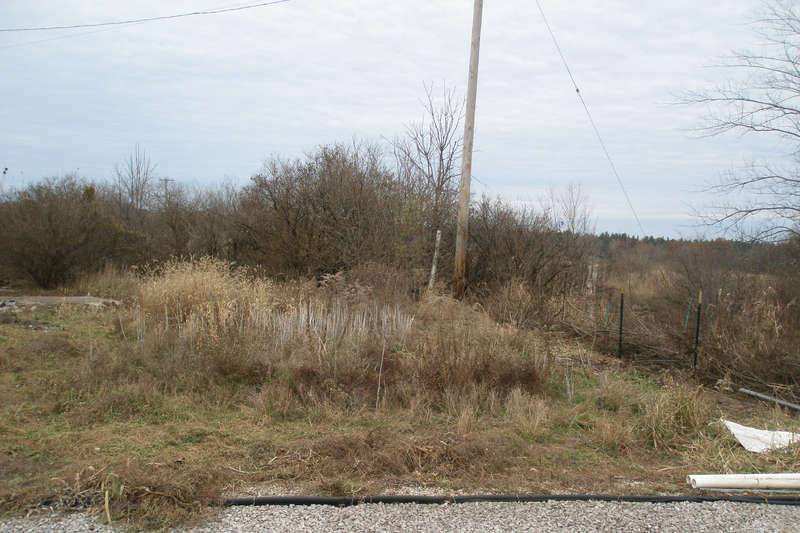 It turned into mostly barren ground that would barely support weeds and grasses. One of our most favorite ahem weeds is sow-thistle - a very difficult weed to eradicate once it gets going (if you don’t want to use weed killing sprays) and it was starting to make a serious attempt at taking over the whole area. 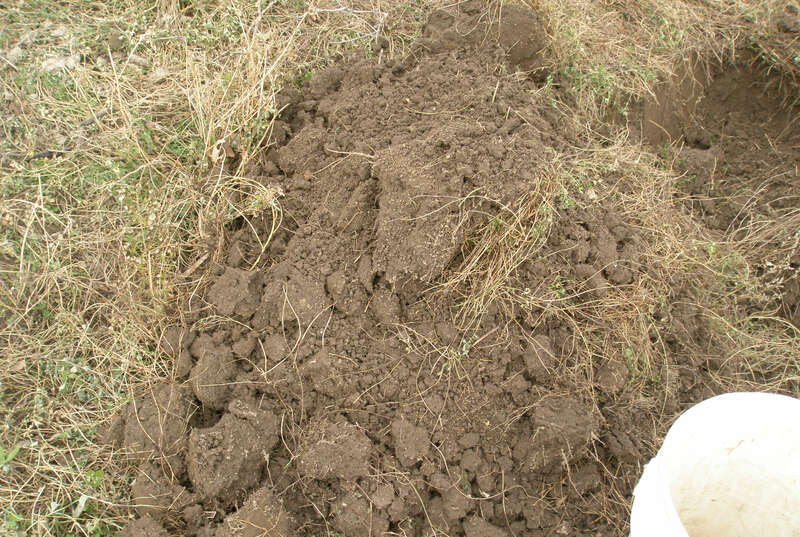 The soil is our normal clay subsoil which has a little sand in it. Not fast draining, but fertile if treated well. This area wasn’t treated very well and was not supporting plant growth. Once compacted and baked in the sun it can take a huge amount of effort to dig. With compacted soil and no plant growth any significant rains ran off (carrying away any surface organic matter and whatever nutrients the worms would bring up) and it was also starting an erosion gully (this is one part of very important things to observe in any landscape - where are your water flows and other flows like the air and energy). Being unfenced and far enough away from the house animals would always be some sort of issue. With the two large drainage ditches along two of the four edges that makes it even more of a challenge. 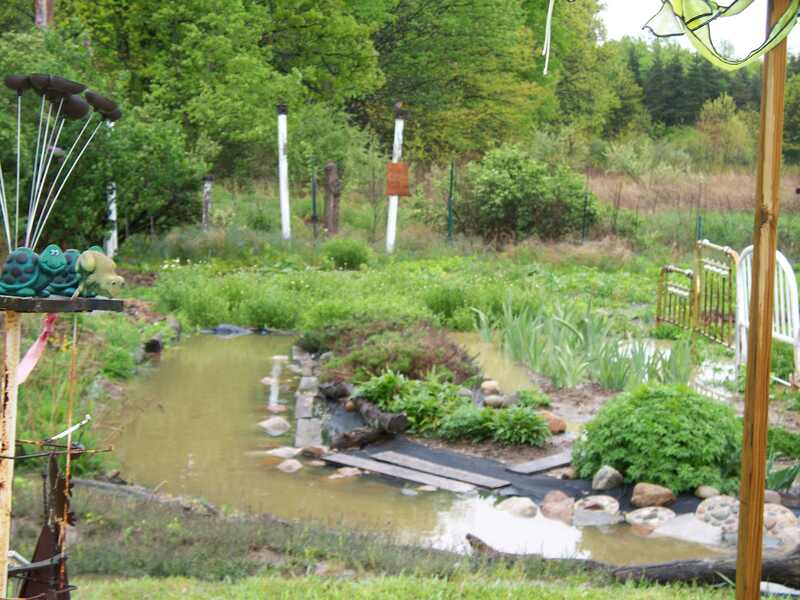 The high water table can also be an issue in the times of more rain. The rough dimensions of the area are 35 feet on the south end, 25 feet on the north end and 55 feet on the longer sides. The east edge is along the large drainage ditch that goes through the property. The north edge is along the hedge and second large drainage ditch that runs through the property. As usual one project means a few more projects may sometimes have to be done first. I needed to put some drainage in for the horseshoe pathway that would collect surface flows in times of really heavy rains. My other drainage plans that were already done helped quite a bit, but I still needed the last stage put in for the extreme cases. Years later I’ve have only seen a few surface flows that used to be normal during a heavy rain, but the big improvement is that the water flows to the horseshoe pathway so it does not leave the property by flowing over an edge, but is directed by drainage tubes. Also, not being rich I couldn’t do the simple thing and bring in yards of topsoil - I had to deal with the soil pretty much as given. The first issue I considered most important to deal with was the erosion gully that was starting to form. This was not easy to fix but the design idea was simple: to level the area and then replant it with cover to keep the soil in place. This immediately would help all subsequent efforts as once you stop letting your plant materials run off then you also have them helping you retain all the energy/nutrients the plants and animals are producing. I borrowed a neighbor’s tiller and ran it over the whole area and noticed there were no worms at all. None. Clay soil can support worm life, but the high water table and lack of organic matter on the surface would discourage them. 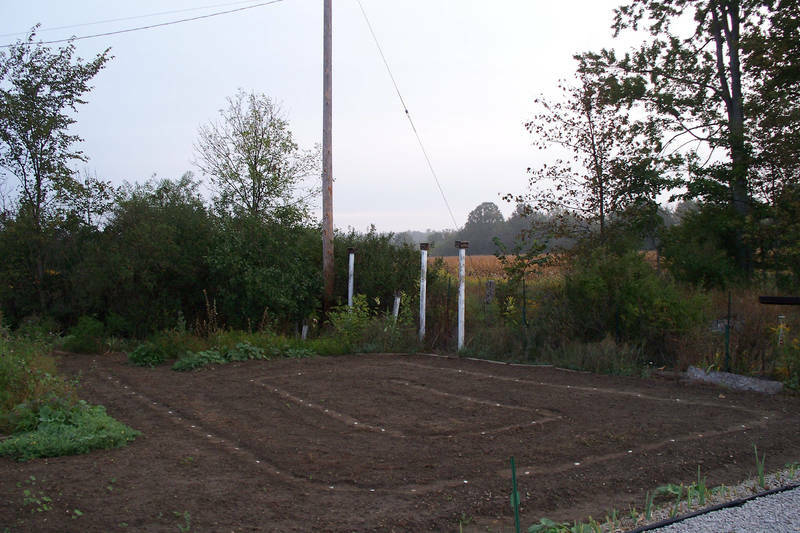 Once I raked the area level then I planted two nitrogen fixing plants in a spiral pattern (to make it interesting). I marked a pathway with small flat stones so I would use that while weeding. 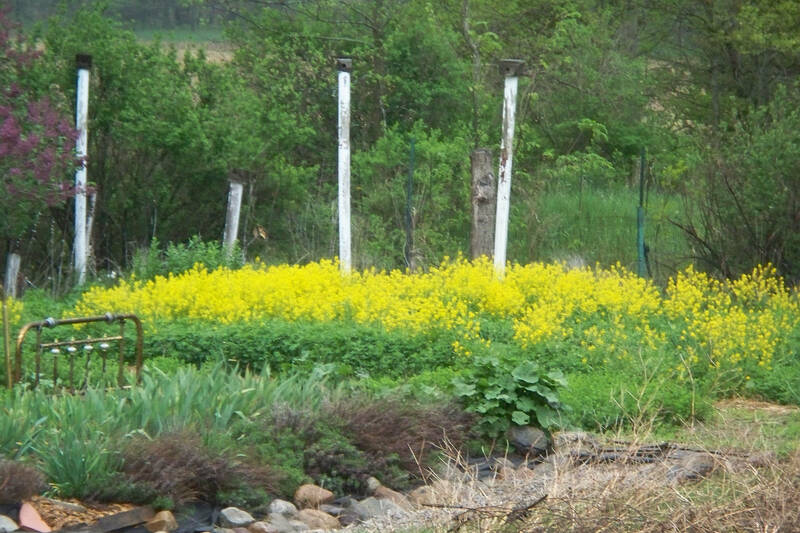 The plants chosen were alfalfa and birdsfoot trefoil. Alfalfa will put down deep roots if given enough time to get established. Trefoil will sprawl more and doesn’t have as deep of a root system but the yellow flowers contrast nicely with the purple flowers of the alfalfa. As time would go forwards I planned on thinning these both out and replacing them with edible garden plants. Not planting the spiral arms wide enough. 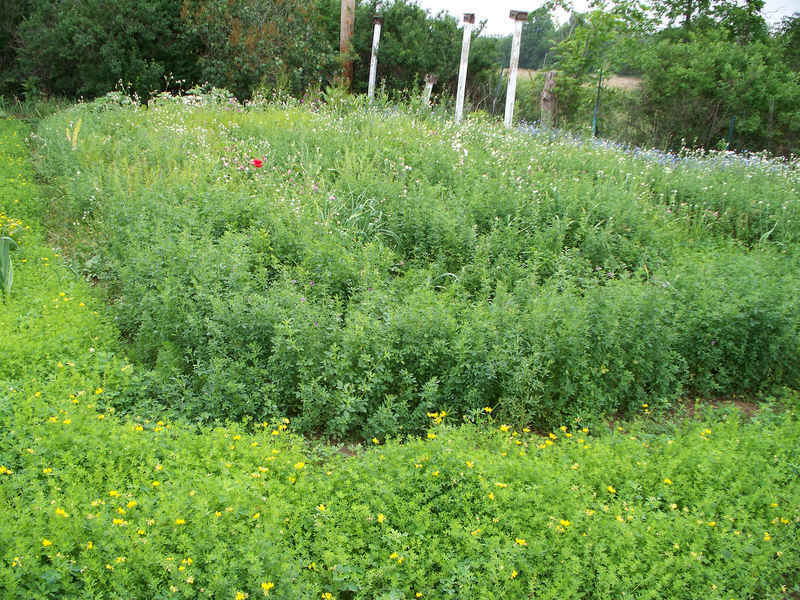 The alfalfa and trefoil both grew well once established but having narrow rows meant that weeds could come in from the sides and more pathway space was wasted instead of growing. 2-3ft was not wide enough - at a minimum I would want the rows to be 4-5ft. The very first fall/winter/spring I had mouse-eared chickweed try to take over. Some of it was ok to keep as cover until the trefoil and alfalfa could get established, but too much could crowd them out. I was able to chop it back once that year and then afterwards in the second and third year I could begin to chop the plants back more often for cycling their nutrients and to simulate grazing - this really gives the worms a jump start. At times I would plant buckwheat and other cover crops for some variety. Some of what I chopped was also used as fertilizer in other gardens as a source of extra nitrogen for the plants. I wanted something edible out of this space, after putting in all that time weeding and leveling and seeing how green it was already. It could produce a few hundred pounds of alfalfa and trefoil which make excellent green manure for gardens or worm food for the worm bins. I still wanted something more. I had garlic and casually tossed a few thousand tiny bulbulles in the garden. In the following years I would find out that digging garlic from this patch was a challenge. It grows well. It doesn’t matter if there is alfalfa next to it at all. So to harvest sometimes I have to dig out surrounding plants. I’ve since been trying to clear the garlic back out of there. I enjoy eating it as green garlic harvested in the late winter/early spring much like a green onion. But getting every clove out of there is work and you have to make sure that you cut the tops off before they can drop more. Along the east edge I’m encouraging rhubarb to grow to help keep the ditch grass from coming in. I really need a root barrier along there to keep this grass out as it is very very aggressive with large roots. I have some phlox flowering plants I let wander around because we like the flowers. I have some bergamot, butterfly weed and the lilac bush in the corner. There’s also some grape hyacynths back there and another white flower I don’t remember what they’re called. There are a lot of wild strawberries along the north side. I’ve also mixed other vegetable plants in the area to see how they would grow and how much of a crop I could get. Beans, peas, turnips, radishes, strawberries, carrots, fennel, beets, dill, lettuces, spinach, squash, onions, etc. Almost everything does ok if you can keep it from being overgrown. I’ve had some huge turnips and daikon radishes and if I clear enough room for the strawberries they also have done well. In the end though, if I want any significant return I’ll have to have a good fence and that isn’t an expense that is worth it. In the meantime we’ll still add whatever recycled fencing we can come up with and see how it goes. When I get extra organic matter from friends who bring me such goodies I’ve been putting some of them back there to give the soil surface another layer of protection and mulch - especially in areas I’ve cleared of weeds or grasses or where I want strawberries to take over. The whole garden needs some weeding through, some areas are worse than others. With the current cold temperatures it looks like I am done for the season with about 1/3rd of the area gone through. I’ll leave some alfalfa plants. I’m going to get rid of as much of the trefoil as I can and replace it with something else (not clovers). For quick growing replacements buckwheat, turnips and daikon radishes are easy enough, but I do need some other longer term plants growing. I was hoping strawberries would work, but the deer seem to really go after them. Some plants we both are allergic to and have to find replacements. I do like creeping charlie and thymes so perhaps i’ll get those going back there. we have tons of thymes around already to use. Having already cleared mints from other gardens I’m not going to be doing any of those.